Last month, a popular trampoline was voluntarily recalled by the U.S. Consumer Product Safety Commission, in conjunction with Sportspower Ltd., the company that makes the trampoline. It was reported that the trampoline's metal legs can move out of position and puncture the jumping area. This is a dangerous injury hazard because the metal leg could cause cuts, bruises and deep puncture wounds to children and adults who use the trampoline. About 23,400 trampolines were recalled. The trampolines were sold exclusively at Sports Authority from April 2007 to May 2012 for about $540. The trampoline model number is TR-14FT-COM and has the word "Parkside" printed on the enclosure net. See picture. Consumers are advised to immediately stop using the trampolines and contact Sportspower to get a free repair kit. 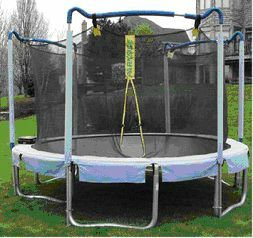 The recalled trampoline could cause serious injuries to your children. If you have a trampoline, it is important to check whether it has been recalled. If you or a loved was injured by a defective or recalled trampoline, you may be entitled to compensation. Injuries caused by defective products can result in expensive medical bills. If you have a products liability case, you can recover your medical bills and other expenses from the responsible party. What Is A Dangerous Defective Product? You can also contact our qualified Pennsylvania and New Jersey products liability and dangerous products lawyers for more information. Call 877.944.8396 for a free consultation.